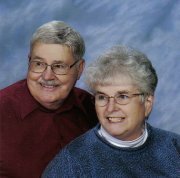 Imagine if you can, what the life of Debbie Sabin was like back in the 50’s as her father worked endlessly to find an oral vaccine to end polio. Now read her story and help us END POLIO NOW!! Will You Do One Thing on August 19th? August 19, 2011 is World Humanitarian Day and I have a challenge for all of you out there who want to make a difference but aren’t sure where to start. Start Small!! Sometimes it’s the small things we do that have the biggest impact on another person’s life and often you may never know that a smile, a kind word or two, a phone call to an old friend, a card or note to a family member may make a difference. The reward is that you give of yourself. Let’s make August 19th a day to practice patience, a day of compassion, a day to think of others, a day to make a difference. Are you with me? Great – now let’s think of things anyone can do. Here’s a list I started: hold the door for the person behind you, smile at the next person you see, call an old friend (or email if you must), make a surprise visit to your mom or dad, thank the cashier, laugh instead of growl at the kids, let the person behind you on-line with one item, go first – what else would you add to this list? Do you have a few extra minutes? Here’s a starter list of ideas: visit an elderly neighbor or stop at the local nursing home with a magazine or puzzle, read to kids at the library, bring a non-perishable food item to your local food pantry, pick up a few personal items to be sent to our Troops, send a thank you note to someone you know who has made a difference, stop at the local park and do a quick clean-up, register to vote, drop off some pet supplies at the local animal shelter, mow your neighbor’s lawn or weed the garden, make a casserole or dessert for a busy mom – now add to this list. Perhaps you want something more: give some time to your local animal shelter – they need both administrative help and folks to walk the dogs; give some time to the hospital children’s ward or visit vets at the VA; make cookies for the Ronald McDonald House or sign up to make dinner once a month; take photos of a special event and present an album or online album to the recipient; could a sick friend or busy mom use some help around the house or someone to do a load of laundry? Does your local community center or school need homework helpers? How about a 5K run or walk to support a person or charity? Some more thoughts in making a difference – look at what is important to you or what inspires you and then match that up with need. There are literally hundreds of news stories every day about need or causes that need help. You don’t need to build a school, climb Mount Everest, dig wells, do aid work in other countries but you could if you wanted to – there are organizations and people who can help you follow a dream. Will you do one thing on August 19th? I’d love to know what you did so write me a comment and I will reply. Here’s a video that shows people of all sizes and shapes helping their fellow humans. You can do the same thing just Start Small! More lovely hats pour in every day. These, from my friend, Cyndi, are beautifully crocheted and in all colors of the rainbow. The kids are going to love them. Some of the most popular are sure to be the lavender and purple, some with decorative buttons and ruffles. There are even ones of camouflage design and color – just made for little boys (or girls) to stay warm and cozy all winter. I tested this out with my three great-grandchildren, ages 2, 4 and 7 who loved them all. We can still use more Hats For A Purpose for kids at risk – October is right around the corner. 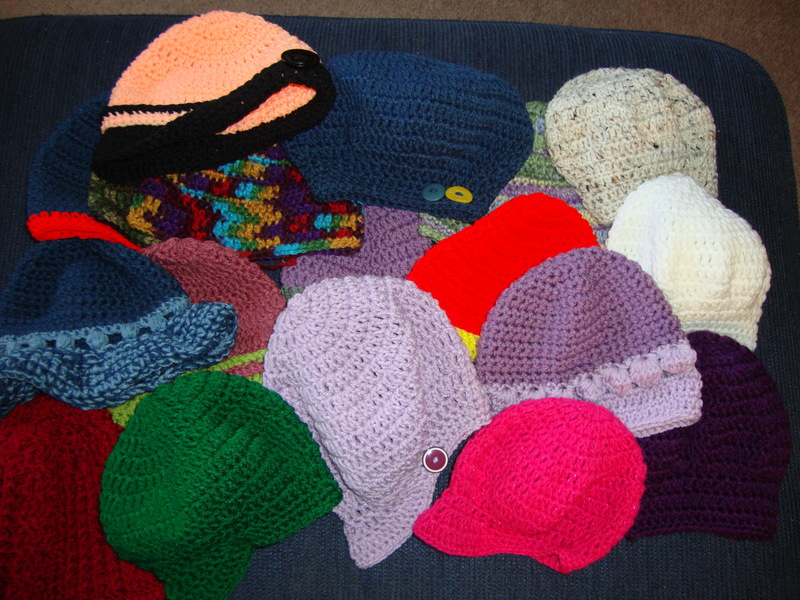 If you or someone you know would like to knit or crochet a hat please let me know. There are no *rules* – any color, any design, sizes for toddler to pre-teen. A hat takes about 2 hours and less than a skein of wool – a real bargain to make a difference in the life of a child. I learned to knit in Girl Scouts during WWII when we made squares for afghans for wounded soldiers. I made sweaters, hats and mittens for our three kids for years. I used to make argyle socks for friends; I made one pair for Stan after we met and then I discovered he did not like heavy wool socks. I did however make a pair each year for an uncle until he passed away (must have been 25 years or so). I knit all through some boring college classes, like economics, and through many meetings. I stopped knitting sometime in the 80’s because it made my elbows hurt, but I moved all the leftover yarn and needles from Ohio to Silver Bay to Ticonderoga. About 3 years ago I picked up the needles, found the old basic hat pattern with variations that came from Family Circle years ago, and started again. For 2 years I donated 22 and 20 hats to the Tiny Tim project here. Having given you the Rotary 20, I am on the 8th one for this year’s December Tiny Tim gifts. That’s my knitting history. I still have a part-time job as executive director of the Ticonderoga Festival Guild which puts on six free summer performing arts programs for children, and this year four adult evening programs, as well as various events and fundraisers during the year.